I buy frozen vegetables in the bulk sizes, usually from BJs, which don't get used in one, or sometimes even two meals. About every other week I prepare a dish that finishes the open bags of vegetables. Okra was on the list this week, alongside chicken. Okra and corn creole sounded perfect paired with crispy chicken. Oh and before I forget, BJs has a 2 lb box (2 lb bags) of Kikkoman Panko bread crumbs for $4.99. In the grocery stores here a regular box, which is 8oz., costs$ 2.79. Pretty good deal huh? Ok back to the meal. I checked out Mary's recipe for Crispy Panko Coated Ranch Chicken but didn't have all of the ingredients on hand, so I compromised. Rather than using Good Seasons Ranch Dressing-Seasoning and mayo, I used bottled light buttermilk ranch dressing. Preheat oven 375. Wash chicken and pat dry. In a large bowl, mix seasons with panko crumbs. Pour ranch dressing into a small bowl. 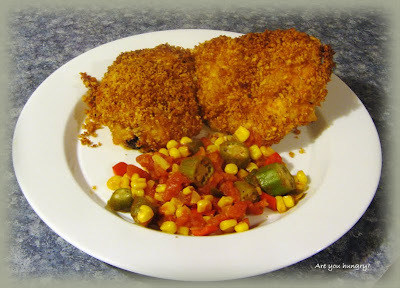 Brush chicken pieces, one ata time with dressing and dredge in seasoned panko crumbs. Place on shallow edge baking sheet. Cook for about 50 minutes or until juices run clear. Very crispy and flavorful. The combination of seasons added just the right flavor, hubby was even impressed! The original made 12 servings, so quantities are half of the original except the hot sauce, you know I love spicy food! Coat large nonstick skillet with cooking spray; place over medium high heat until hot. 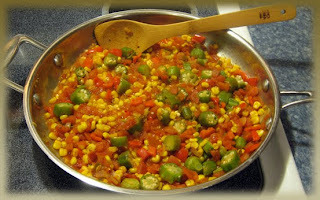 Add green pepper and onion; saute 3 minutes or until tender. Now this was darn good, nice and spicy yet not so much that it brought on a sweat! Turned out to be the perfect side dish for crispy ranch chicken.